In this article, we will see how to develop an Android application containing sidebar navigation drawer menu with icons and counter. Here count specifies, how many times the drawer menu item is selected by the user since the application is opened. In order to display ActionBar in legacy Android versions, we are making use ActionBarCompat library ( V7 ) . For navigation drawer library, we are making use Android Support Library ( V4 ) . 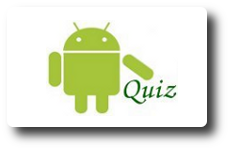 This application is developed in Eclipse 4.2.0 with Android SDK ( 22.2.1 ) and ADT plugin ( 22.2.1 ). Screenshot of this application is available towards the end of this article. Yah it is, i managed to use this tutorial targeting SDK 18 (4.3) and minimum SDK 8(Froyo, 2.2) but i was testing in my real device which runs 2.3, i also believe i can also go lower than that, Eclair(2.0). Thanks! I have a doubt if I want to change the blue background in a selected item of the drawer, What I have to do? And if I want to have a fragment that start with the app instead of empty screen… what I have to do? "0" will be your fist item in the list but you can change to second item which will be "2". Hope that helps. Thank you very much, I did it and works. Can the drawerlayout displace the content of the main view rather than just overlaying it? realy nice tutorial for api 8 and higher. thx author! How can I change the image size of the first item on the menu? Didn’t tried this code but think it’s ok. Feel free to contect me if you have some problems. I loved ur example. However i find my app crashing on device 4.0 and above when using appcompat action bar. Am i missing something as app works fine below 3.0 but crashes on 4.0 above. Was using the slidingmenu from jfeinstein for some time and started searching for this navigation drawer which uses support library from net but nothing seems to work for lower version. yours where pretty neat and works. how can i change the drawer tittle from country? Thanks for your nice example. But I got some errors when I imported your project into my workspace. 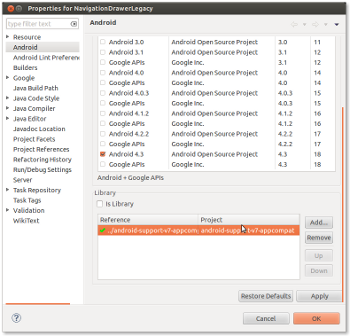 2) imported android-support-v7-appcompat into same workspace. 5) If i am not wrong then I guess there is v4 support library available in appcompat(v7) and v4 available in lib folder of navigation project. so is there any mismatch happening? please help me. 6) I tried to delete from one of project clean but no use. still giving error. It is not recognising Fragment class. when i deleted v4 library ther error gone but then it is not recognising replace method. How can I change the itam name at run time. Suppose you click on India. It should be change to Bharat after clicking on it. And same on click Bharat it Should be change to India. Replacement should be run time. Can you show how to put section header to the listview to distinguish between the items Mr Mathew ? Can you please extend the code to have a collapsible list. Like World has 7 continents and they have different countries. how to put a expandable list in navigation drawer!!! How to add expandable slider menu in navigation drawer? hi sir,i want to implment this tutorial for right-to-left drawer,but can only implemented drawer layout from right-to-left slide,but i can not implementing navigation drawer toggole icon positon from left side to-right-side,how i can change drawer toggle icon from left to rigt ?it is possilbe? How to remove that green highlighting when items are clicked?